The cash register is an essential business tool that is often overlooked as one of the transforming mechanizations of the industrial age. A cash register records the amount of a sale, supplies a receipt to the customer, and keeps a permanent journal of daily transactions. Today, cash registers are highly automatic, and have many functions that help in the organized running of a store or restaurant. A more expensive and complex register system can be used to keep track of inventory and signal distant computers to reorder supplies. It can tally sales by department or by class of item, saving managers time and paperwork. This kind of machine is most often used by large chain retailers or restaurants and referred to as a point of sale (POS) terminal. The POS terminal may be a hodge-podge of components from different manufacturers. More conventional cash registers used by smaller establishments are generally one-piece machines with a built-in cash drawer, printer, and display. These are almost all manufactured in Asia but designed by distributors in the country where they will be used. The cash register was apparently invented out of desperation. The creator was James Ritty, an Ohio restaurateur. Ritty ran a café in Dayton in the 1870s. The place was popular and always filled with customers. Nevertheless, the business continually lost money. Ritty blamed the dishonesty of his bartenders, who either kept money in their pockets or in an unlocked cash drawer, often nothing more than an old cigar box. This loose monetary system did not provide anyway of keeping track of sales. If a customer returned to a shop after buying something, saying he had been overcharged or not given the correct change, there was no objective way to settle the dispute. The open box also meant that employees were always within reach of tempting cash. In Ritty's time, theft by clerks was a way of life, and shopkeepers had little defense against employee dishonesty. Ritty changed bartenders many times but continued to lose money until he was driven to a nervous breakdown. To ease his mind, Ritty took a ship for Europe. On the ship he made friends with the ship's engineer, and spent hours in the engine room. There he observed the workings of an automatic device that recorded the revolutions of the ship's propellers. From this, Ritty imagined he could make a similar device that would record amounts of money passing through the cash drawer. He reputedly cut short his vacation to rush back and begin work on the prototype. Ritty assembled his first cash register in 1879, and patented a second, improved register later that year. Ritty went into business with "Ritty's Incorruptible Cashier' after perfecting a third model. Ritty's early machines had two rows of keys running across the front, each key marking a money denomination from five cents through one dollar. Pressing the keys turned a shaft that moved an internal counter. This kept track of total sales for the day. The amount of each individual sale was shown to the customer on a dial similar to a clock face, with one hand for the cents and one for the dollars. Because the machine kept a daily total, any pilfering would be obvious. A later model kept the clock face and included a paper roll punched with pins to provide a more permanent record for the shopkeeper. However, Ritty was unable to ignite any excitement for his new device. Apparently he made only one sale, which was to John H. Patterson. Patterson ran a small coal business, but was so taken with the Incorruptible Cashier that he decided to buy Ritty's company. Unfortunetely, Ritty had already sold his business to another party, Jacob Eckert. Eckert had made a vital addition to the machine, a bell that rang when a sale was made. Eckert ran the business as the National Manufacturing Company with several partners. John Patterson arrived in Dayton in 1884, eager to buy the small firm. After making a preliminary deal, he discovered that National Manufacturing was the laughingstock of Dayton. The company had not made any money, and no one believed that it could. Patterson tried to buy his way out of the contract, but was forced to complete the sale. Patterson changed the name of the firm to the National Cash Register Company. The new company quickly improved the cash register. By 1890, the machines printed customer receipts as a standard feature. In 1906, the cash register was electrified. The company made a science of advertising and selling, becoming the role model for many other industries with its canned sales talks and innovative distribution of sales territories. By 1900, the company had sold over 200,000 registers and sent salesmen throughout Europe and South America. As early as 1896 it had sales in China, and by the end of World War I, National Cash Register was bringing in almost half its sales from overseas markets represented by at least 50 countries. The number of registers sold in 1922 alone was over two million. The company dominated the industry, buying up competitors when convenient. National Cash Register continued to develop its product line, coming out with new features to respond to customer demands. By 1944, the company had applied for 2,400 patents. With the advent of micro processing technology in the 1970s, the cash register industry changed. Most of the manufacturing moved to factories in Asia, and eventually two basic types of cash register evolved. One type is the generally low-end, all-in-one machine usually referred to as an electronic cash register, or ECR. The other wing of the industry is the POS terminal, which is more than a cash register because of its superior data processing ability. Both are manufactured in similar ways, though the ECR may be shipped to the customer complete and ready to go, where the POS is made up of different components that may not meet up until the customer installs the terminal. Raw materials for cash registers are similar to materials used for other electronic products. The principal components for an ECR are an Acrylonitrile Butadiene Systrene (ABS) plastic casing, circuit board, metal printer, metal cash drawer, ABS plastic keyboard, and a liquid crystal display panel. ECRs are made at factories that also specialize in consumer goods such as televisions and VCRs. The materials and the construction process are virtually the same for all these products. 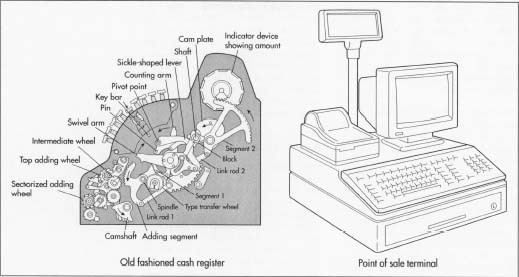 Cash registers differ from other consumer goods, though, in the importance of the design process. Though cash registers are mostly made in Asia, they are used around the world. All except the lowest-end products need to be designed for the country and particular industry where it will be used. In the United States, most retailers or restaurants wanting a more specialized machine order their registers through a domestic distributor. The distributor works with the customer to understand the specific tasks the cash register needs to perform. Perhaps the register needs to be able to recall certain records of customer transactions. A cash register for a dim bar may need an easy-to-read display. The cash register in a restaurant may print one receipt for the customer, but print different information in the kitchen, telling the cooks what to prepare. The cash register distributor will design the software for these special functions or have it designed at a software company. The distributor then approaches the manufacturer with the list of needed features. In some cases, the new features can be made to fit in a preexisting model or the manufacturer's engineers may have to redesign parts and processes. An early model cash register compared to a modern day POS terminal. Cash registers are manufactured at large plants using a classic assembly line system. Twenty to 25 workers stand in front of a conveyor belt that may be 200 ft (61 m) long and move at 2-3 mi (3.2-4.8 km) per hour. Workers with screw guns and soldering irons attach parts as they come down the assembly line. 1 Workers use lasers to cut the sheet metal to the customer-specified size. They then put the flat sheet of metal on the conveyor belt, which transports the sheet to a punch press. The hydraulic press has precut shapes that are clamped onto the sheet metal. The press is then closed and the shapes are cut out. 2 As the cut metal exits the punch press, workers weld the pieces together for the drawer and drawer case, these are then painted and dried. 3 The case and drawer move down the assembly line and workers attach the till and latch components, which are assembled out of the country. The cash drawer has a removable till that is opened by releasing a latch. The latch is activated by an electromagnetic device called a solenoid. When a current flows through the solenoid, it creates a magnetic field that moves a steel plunger, releasing the latch. Workers screw and solder the latch bracket sub-assembly and attach it to the back of the drawer. 4 Some parts of the cash register, such as the drawer, may be made as sub-assemblies or bought from specialized suppliers. On the assembly line, workers begin by constructing the power supply. 5 Next, workers manually assemble the logic board by soldering, screwing, or snapping the circuits into pre-cut destinations. 6 Workers build the printer device, the display panel, and the keyboard, and attach these to the machine as it passes down the assembly line. 7 Finally the casing, which is usually made of plastic created through injection molding, is screwed onto the machine. A certain percentage of the cash registers may be taken off the assembly line at this point for quality control testing. The rest run through a boxing machine, which packages them securely. 8 The boxes are placed in cartons, and the cartons are labeled and sent for shipping. Distributors may warehouse them or send them directly to customers. 9 Because of the complexity of most cash registers, distributors help install them for customers and show them how to use the devices. In the case of a sophisticated POS the distributor makes sure that the terminal is properly integrated to work together as it should. Quality control may be done both at the manufacturing plant and at the distributor's facility. The amount of quality control differs with the price of the product. A low-end ECR may have minimal quality checks. For a mid-grade machine or component, the manufacturer may check 10-15% of the devices as they come off the assembly line. On a top-quality machine, a higher percentage—up to 50%—may be checked. The distributor too generally gauges how much quality control to do according to the price and sophistication of the machine. Usually the distributor plugs in the machines to make sure the mechanical components are working. The distributor may leave the machines, or a sampling of the order, on all night to make sure they don't burn out. The distributor also runs diagnostics on the software. Other tests are also conducted depending on the order. There are no unusual byproducts or waste associated with cash register manufacturing. Used cash registers can be reconfigured and upgraded. While some distributors concentrate on new machines, a subset of the industry specializes in rescuing used machines and updating them. Most cash registers used in the United States are 13-15 years old. Early cash registers are now highly valued as collectors' items. Most advances in cash register technology come from the POS end of the industry, where large users such as giant chain retailers can take advantage of economies of scale and employ sophisticated new software or hardware. Much of this technology eventually trickles down into ECR manufacturing. Communications between registers was once an advanced feature, but it is becoming standard even on mid-level machines. Cash register software is constantly evolving in response to pressure from customers. Cortada, James W. Before the Computer. Princeton: Princeton University Press, 1993. Crandall, Richard L., and Same Robins. The Incorruptible Cashier. Vestal, New York: The Vestal Press Ltd., 1988. Marcosson, Isaac F. Wherever Men Trade: The Romance of the Cash Register. New York: Dodd, Mead & Company, 1945. McCrory, Anne. "Jargon Judge: Point of Sale Device." Computerworld (20 July 1998): 51.